Ruffled, satiny purple-red petals surround bright yellow centers. It takes a few seasons for these blossoms to reach their full potential, but you will be amply rewarded for your patience. The Tree Peony is one of the most glorious shrubs available to American gardeners. Its huge, silky flowers are similar to those of herbaceous Peonies, but the range of color runs from pure white through pinks and reds into lavender and yellow. Mature plants reach 4–5′ and carry up to 50 of these exquisite blooms. Tree Peonies grow best in full sun or partial shade (required in the South and warm areas of western Zone 9) and evenly moist but well-drained soil with a pH close to neutral. Hardy, disease- and (best of all) deer-resistant. 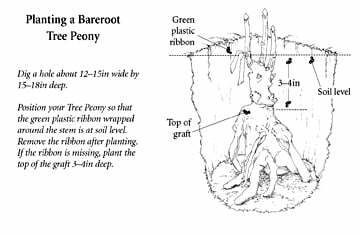 For more information on Tree Peony care, click Growing Guide.